http://www.saferinternet.org.uk/advice-centre/parents-and-carers/parents-guide-technology has created a guide to explain these devices and highlights the safety tools available, empowering parents with the knowledge they need to support their children to use these technologies safely and responsibly. All mobile network providers provide parental controls. Some will have these on as default, but others you will need to request to be turned on. For example, Tesco Mobile and O2 have a parental control option to ensure that only websites they have classified as suitable for children under 12 can be accessed. Contact your service provider to find out about filtering options. When smartphone users are at home, they often connect to their home wireless internet (to save using up their 3G data allowance). This does mean that any filtering options set up with your mobile provider do notfunction. All of the major internet providers offer free filtering tools that work across all devicesconnected to the home internet. Some apps can help filter out age-inappropriate content or help restrict some of the smartphone functions, so have a look in the app store. It's also possible to connect to public wifi when out and about, with shops, cafes and restaurants increasingly offering internet access. 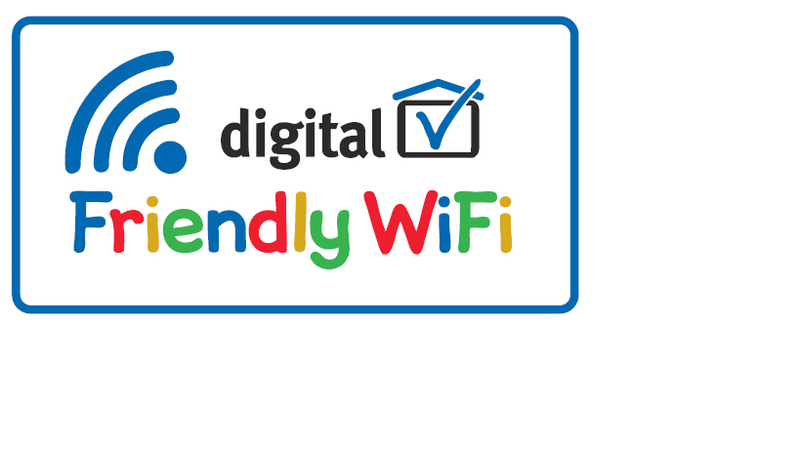 Look out for the Friendly WiFi symbol which means the content has been filtered. Some games consoles, like the Xbox 360 and the Xbox One, have a timer so that the console switches off after the allowed time. UKIE, the body that represents the interactive entertainment industry in the UK, recommends that all games should form part of a healthy and balanced lifestyle and recommend that games players should take five minute breaks every 45-60 minutes. With Christmas fast approaching, your child may be searching online. No search engine is ever completely safe and appropriate supervision should always be given. Have you considered bookmarking search engines suitable for children to use? If your child uses search engine sites such as Google or Bing, please ensure that you have turned the safe search filtering tools on. However, this this only reduces (not removes) the possibility of accessing inappropriate content either accidentally or otherwise.